A 3/4-sized version of the company's Gold-D6 dreadnought, the Gold Mini features a solid mahogany back, sides and neck. Cort has announced its new Gold Mini dreadnought. A 3/4-sized version of the company's Gold-D6 dreadnought, the Gold Mini features a solid mahogany back, sides and neck. 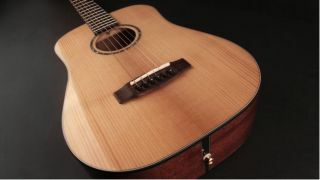 The neck is supported by a double-lock neck joint, and is reinforced with two pieces of walnut. The traditional dovetail is also reinforced by an added bolt. The guitar's 19-fret, 22.8-inch scale length makes it a travel-friendly choice, while its torrefied ATV (Aged To Vintage) Adirondack spruce top gives it a big, open tone.